With the increasing demand for features for third party browsers on the Windows Phone platform, UC Browser has rolled out an update that gives the client support for background downloads. UCWeb today released the UC Browser v3.2 for the Windows Phone platform with new added features like Background Downloads. While the default phone browser, Internet Explorer, doesn’t support downloads, the new UC Browser which is available for the Windows Phone 8 and Windows Phone 7.x smartphones, supports various types of file downloads. The UC Browser 3.2 brings in the much awaited Background Download feature which allows you to download files even after exiting the browser. Further, even if the download is interrupted due to certain reasons, it will automatically resume. This feature requires high speed internet connectivity and may not function properly under a 2G network. The UC Browser 3.2 also brings in enhanced Download Management which allows you to categorize the downloaded files and get quick access to them directly from the browser. The browser also comes with UDisk cloud storage service which allows you to store files directly on the cloud. Each account gets 6 GB of cloud space which includes 2 GB permanent and 4 GB of temporary storage. The UC Browser 3.2 provides a smoother experience with the new Preloading feature which automatically loads the next page when you reach the end of your current page thus creating a seamless reading experience. The new version comes with an improved UI and more gesture support. 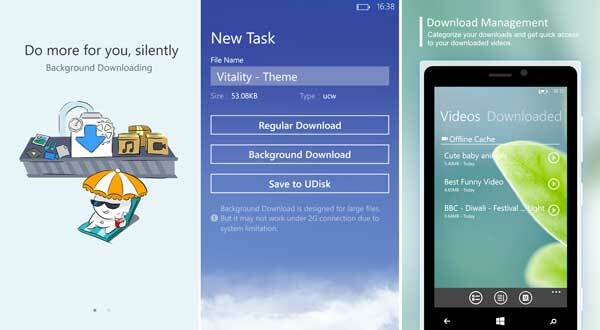 You can download the UC Browser 3.2 from the Windows Phone Store.